Financial illiteracy and financial insecurity are two common issues facing people of color today. Julien and Kiersten Mitchell Saunders did not realize how common this problem was until they started considering their futures and what it would take to achieve their financial goals. In the process, they discovered a generation of older millennials sharing the life lessons they learned with others. Following the birth of their first child, the Saunders launched the website rich & Regular, a project as a means of assisting other young, African-Americans in understanding the importance of financial well-being and wealth. After being under development for two years, it is designed to be a web-based platform where the two share tips on eliminating debt and personal finance through personal experiences. African-American household wealth, according to a recent report, is on a path to hit $0 by 2053. According to a 2016 U.S. Census Bureau American Community Survey, nearly 24 percent of African-Americans live below the poverty level. By the time Julien turns 40 in the next few years, he and Kirsten will have paid off the mortgage on their home. Not long after that, if things go as planned, they hope to retire completely from the corporate world. Bryant Eubanks, 24, did not have anyone teaching him about personal finance, saving, and debt when he was younger. However, he did have examples. An Atlanta native and Morehouse College graduate, Eubanks, remembers waking up on early Saturday mornings and finding his uncle sitting at the kitchen table with his glasses, shuffling through papers with his calculator. The first in his immediate family to attend college, Eubanks graduated with a degree in business administration with a focus in management. He quickly realized that prior to college, he didn't know much about accounting, marketing, and formulating a business plan. “This made me think that if I, valedictorian of my high school, wasn’t knowledgeable of this information; I could only imagine how many other African-American boys and girls were unaware,” he said. Since graduation, Eubanks has continued his work as a trainer for Chick-fil-A as well as working part time as a teller for Wells Fargo. He does not want to become a prisoner to the same paycheck-to-paycheck cycle his loved ones experienced, so he created a spreadsheet listing variable and fixed expenses as a way to manage his finances. 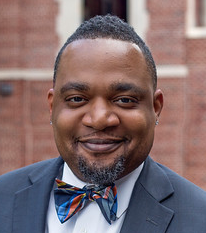 He also entered into the Executive MBA Program in the Terry School of Business at the University of Georgia and hopes to help others achieve their financial goals. “I believe that my initial reason to major in business led me to a greater purpose of mentoring and educating the next generation of becoming more financially literate and business savvy,” he said. Marcus Garrett and Rich Jones, founders of the podcast Paychecks & Balances, are also helping younger people through their life experiences. They describe the podcast as a personal finance and career advice resource geared toward millennials interested in the intersection of work, money, and life. Trial and error, said Garrett and Jones, is how they learned much of the information they share on P&B. Their misfortunes are what they believe draw their listeners to the podcast. Saunders, Garrett, and Jones said this is why they are doing what they can to help others not fall into the same traps.